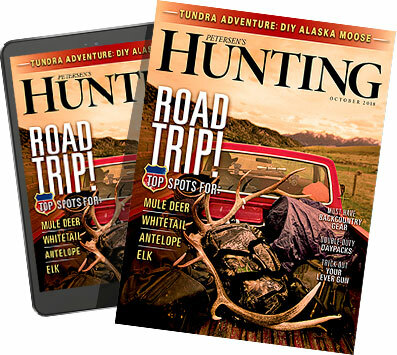 For hunters of the '50s, who often camped right where they hunted, a station wagon made sense — it could carry plenty of hunting gear and had a drop tailgate for cooking, and the inside was big enough to sleep fairly comfortably. And while station wagons are pretty much extinct in America, the theory of car camping still makes sense. For the most part, hunters are still driving to their spots, and there is lots of public (free) camping on National Forest land. Don't forget one of the most enjoyable parts of any hunting trip: telling stories around the campfire before rolling into a sleeping bag — something you can't do in a hotel or lodge. For many, a roof rack is a necessity. You can haul extra camping gear, and it is required if you plan on using a rooftop tent. When it comes to selecting a functional roof rack, look Down Under. Australians regularly use their vehicles for camping and have figured out a thing or two about how to build a functional roof rack. Rhino-Rack is one such Aussie outfit. I tested their Pioneer Platform and loved it. I prefer the flat design as it makes securing large objects like tents or spare tires easy. To maximize the rack, Rhino makes a plethora of accessories from tie-down points to spare tire straps to high lift and shovel mounts to awning brackets and a rear roller bar for loading heavy objects like a kayak or paddleboard. Like roof racks, rooftop tents are commonly used the world over, but they are relatively unknown/unused in America. However, spend a night in one and you will be hooked — they'll absolutely change your camping experience. Warm and dry, high above the cold ground, they house a thick mattress as well as all of your bedding and pillows — all of which stay in place when the tent is collapsed, so time from parking to sleeping is measured in minutes. Rooftop tents come in two styles: the soft-shell foldout design and the hard-shell pop-up design. I have used both, and they each have pros and cons. The soft-shell style takes up less space on top of your vehicle (as the mattress folds in half), but in extreme weather conditions, like freezing rain or snow, they can be hard to fold back up. The hard-shell style requires a bigger mounting area (the same footprint as the mattress), but set up and take down is incredibly fast even if the outside of the tent is wet. There are over a dozen manufacturers producing rooftop tents not including Chinese knockoffs (avoid these like the plague, as for the most part the quality is lousy), and of all the models I have tried, I was most impressed with the James A. Baroud tents. Made in France, Baroud tents are built to exacting ISO standards. The rigid, tough outside shell is composed of fiberglass-fortified polyester — strong enough to haul a full-size spare tire on top. The fabric is aluminized polyester that is completely waterproof and breathable and reflects the sun to keep the interior cool. All openings feature a full zippered flap as well as mosquito netting. The roof has a small solar charged fan that circulates air to eliminate condensation. When I field-tested the Grand Raid Evo, mounting to the rack was simple and straightforward. Once there, the 140-pound unit was unnoticeable (and noiseless) when driving. There are two latches in back and two in front. Open them and the Grand Raid literally pops up, assisted by the ALKO gas-charged struts. Closing is just as quick and easy. Pull down the top, tuck in any material, and reapply the latches. Not only is this tent ideal for extended camping trips, but also it is quick enough to deploy that snoozing for a couple hours in a parking lot en route to your hunting area is a snap. When camping, you rarely have a good place to throw trash. Wal-Mart bags (or, if you thought ahead, Hefty bags) tied to a tree limb work, but they are constantly flapping in the wind, overflowing and tearing. The Trasharoo, however, is an extra-large, extremely tough rubberized Cordura bag with heavy-duty straps. Designed to be attached to a rear-mounted spare tire (such as on a Jeep or FJ), it can be attached to anything from a tree limb to a roof rack. Extremely well-thought-out, it sports MOLLE webbing to attach other pouches to it as well as built-in mesh pockets to hold items like propane bottles. The top flap also has a zippered pocket for holding extra bags. When not being used for trash, the bag is excellent for hauling firewood into camp or a greasy stove home for cleaning. As a final note, two Trasharoo bags can be buckled together to make a pannier system for hauling out quarters of meat on horseback — very versatile. What really impressed me about the Trasharoo was the quality of the build: 100 percent made in America and priced under $50 — one of the best buys I have seen in a while. Awnings go hand in hand with a roof rack. At first blush, an awning seems like an unnecessary luxury, but it only takes one use to realize its game-changing ability. Hot, sunny day? Roll out the awning for some instant shade. If it is pouring buckets, the awning keeps camp dry, making chores like cooking enjoyable. Simply put, it is one of the best investments any vehicle-based camper can have. Installation is simple. Two brackets secure it to the side of the roof rack. Unzip the case and the awning is inside. The legs, adjustable for length, fold down, and two more fold out to stabilize the sides. The Rhino-Rack Sunseeker awning I tested sports mesh panels, which creates a bug-free environment for eating or hanging out. Unlike some other manufacturers that only hang mosquito mesh on three sides (which does little as bugs fly under the vehicle), the Sunseeker features full four-side coverage. In addition to the bug-free space, you can zip Rhino-Rack's Tagalong tent to the awning to create a comfortable base camp. After using this awning, any vehicle I own in the future will have one. Even though the station wagon is dead in nearly every circle of Americana, car camping doesn't have to be a thing of the past. More and more Americans are rediscovering the joys of camping right where they hunt. With these products the experience is as good as ever and, truth be told, probably a whole lot better than it used to be.